CREBL2 antibody LS-C196962 is an unconjugated mouse monoclonal antibody to human CREBL2. Validated for ELISA and WB. 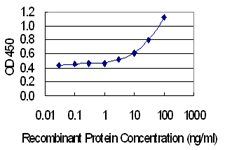 CREBL2 antibody was raised against cREBL2 (NP_001301.1, aa1-120 full-length recombinant protein with GST tag. MW of the GST tag alone is 26 KDa. Western Blot analysis of CREBL2 expression in transfected 293T cell line by CREBL2 monoclonal antibody (M04), clone 1C1.Lane 1: CREBL2 transfected lysate (Predicted MW: 13.8 KDa).Lane 2: Non-transfected lysate. Detection limit for recombinant GST tagged CREBL2 is 1 ng/ml as a capture antibody.